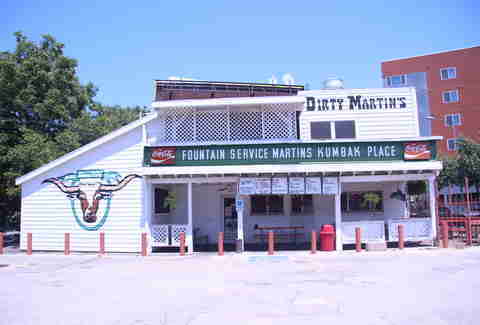 While Austin doesn’t quite have the abundance of historic buildings and landmarks to which older cities lay claim, those of us who have been here long enough can at least take pride in reminiscing about the days when Lululemon was Waterloo Records, or when Licha’s Cantina was home to the Typewriter Museum. 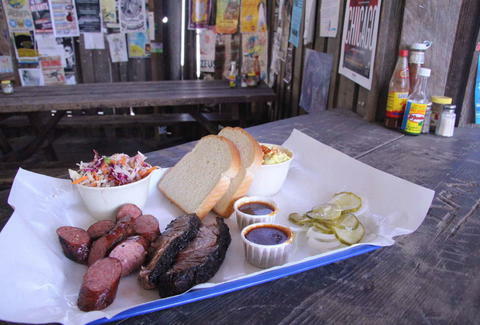 While some places come and go, we have plenty of iconic dishes that continue to stand the test of time (sorry to break it to you, but Franklin Barbecue is not (yet) seasoned enough to house one of them). As a testament to Texans’ love of smoked meats, liquified cheese, and fried foods, we rounded up 15 of the most classic dishes around town. Say what you will about (insert name of favorite barbecue here), but Ruby’s has been serving consistently juicy, flavorful brisket since 1988 -- and you can actually get it after the sun goes down, which is more than you can say for some of the most hyped-up barbecue places in town. Besides the essential brisket, their snappy hot sausage is a must, and the poppyseed-flecked, creamy cole slaw and mustard potato salad are some of our favorite barbecue sides in town. And there’s nothing more Austintatious than enjoying your tray out on their covered patio, where years’ worth of flyers are stapled onto the smoke-soaked wooden walls. 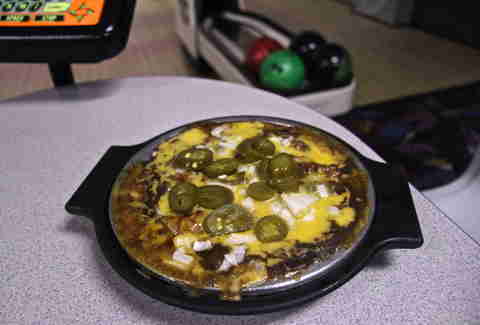 You’ve gotta love a bowling alley that claims to make the best enchiladas in town, and Dart Bowl Cafe has been serving theirs the same way since 1958: bubbling-hot in a personal casserole dish, swimming in melted American cheese, and topped with a meaty chili not unlike Hamburger Helper. Sliced, pickled jalapeños complete the balanced meal (can’t forget the veggies). 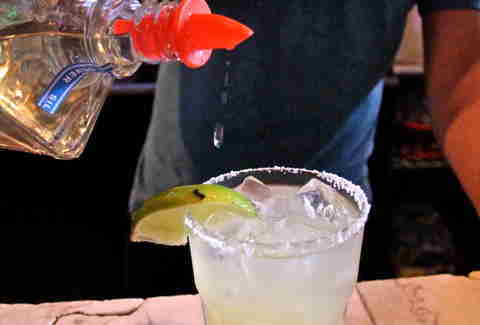 Wash it down with a Lone Star and get ready to strike! Any fan of Dazed and Confused needs to visit Top Notch, where one of many quotable Wooderson scenes was filmed. Inside, there’s even some movie memorabilia hung on the walls, like one of the wooden paddles Ben Affleck used to torture incoming freshmen. 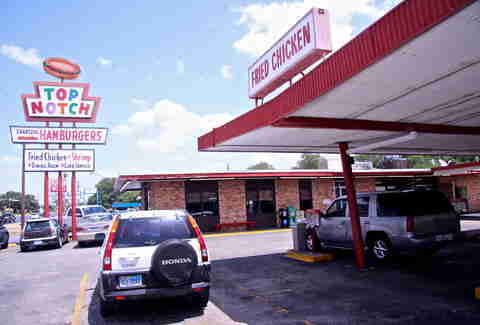 But the best way to eat at Top Notch is to cruise up slowly, windows down, "Slow Ride" playing on your eight-track, and order a takeout box of the crunchy fried chicken on your way to the moon tower party. You’d be a lot cooler if you did. When Texas land commissioner Bob Armstrong walked into Matt’s El Rancho over 40 years ago and asked for them to surprise him with something new, he probably didn’t realize the meaty cheese product they presented would be named after him and become a best seller for years to come. Why all the hullabaloo? 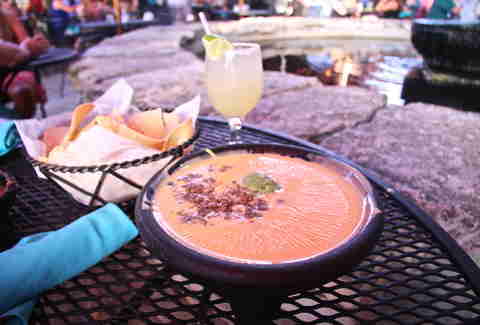 Well, while all the other Tex-Mex places in town were serving their chile con queso au natural, the Bob Armstrong Dip featured spiced ground beef and a scoop of guacamole atop their bowl of melted American cheese. When a place has been around since 1926, they’ve got to be doing something right. And, dirty or not, Martin’s sure keeps ‘em coming back. Grab a seat at the counter to watch up close and personal while the cooks smush balls of ground beef on the flat-top, then top them with melted cheese, mayo, pickle, and a tomato for a most delicious and perfectly greasy burger. Purists will go for the dark, golden-brown French fries, but live life dangerously, why don’t you, and opt for some onion rings or fried pickles! Oh, and two words: crushed ice. Some go for the melty plates of migas. Others, the picadillo served in bolillos before each meal. And yet others swear by the biscuits, which are the reason for the squeeze bottles of liquid margarine on each table. Hey -- to each his own! 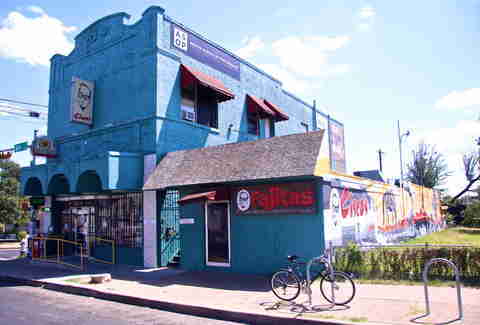 But what Cisco’s has become known for (since 1948) is their steak fajitas, which come as a full or half order, in tacos, on nachos, or added as a side to any of their breakfast egg plates. The interior is also a bit of an unofficial gallery filled with Austin history, making it an essential stop for anyone who dares call themselves an Austinite. Long before 24 Diner opened its Downtown doors, selling free range eggs Benedict and organic hash browns, there was The Frisco Shop. And the old-school greasy spoon still sits far up Burnet Rd (which must’ve been, like, Pflugerville back then!) and, like any good diner, features all-day breakfast and blue plate specials like smothered steak or corned beef and cabbage. But the pie is truly not to be missed. 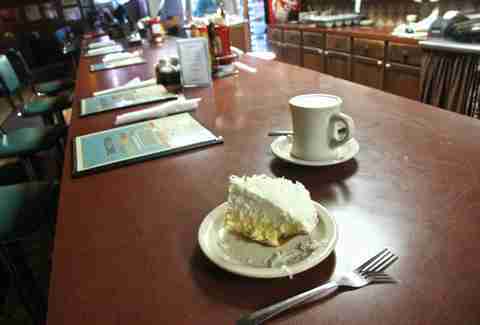 They feature a daily selection of homemade creations, like pecan, cherry, apple with rum sauce, and an award-winning coconut cream pie. And, from 3-5pm each day, it’s all half price for happy hour. Texas: where even the tofu is fried. Back in 1976, when Whole Foods was just a twinkle in John Mackey’s eye, hippie Austinites had Wheatsville Co-op for all their grocery needs. The popcorn tofu po’ boy was invented some years later by a cook nicknamed Wonko. It was immediately so popular, they sold out daily and eventually upgraded to a fryer big enough to keep up with the demand. In 2011, they added a Buffalo popcorn tofu just to spice things up. Oh, you thought there was going to be a healthy item on this list? That might be possible if Billy’s incredible gardenburgers weren’t also... well, fried. 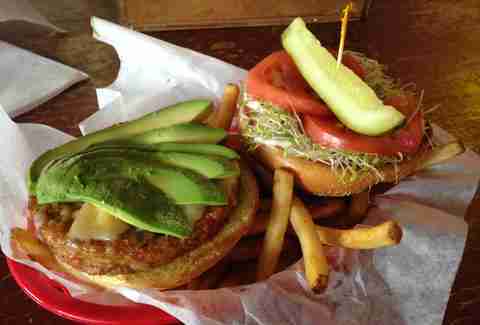 They are then topped with melted smoked Gouda, a healthy smear of mayo, slices of fresh avocado and tomato, a pillow of sprouts, and a pickle spear. This bad boy is presented over some golden fries and beckons for a cold glass of draft beer (and they have plenty to choose from). The extensive veggie menu at this old punk hangout is enough to satisfy even the most carnivorous and jaded of your friends as they reminisce about how much better everything was "back in the day". 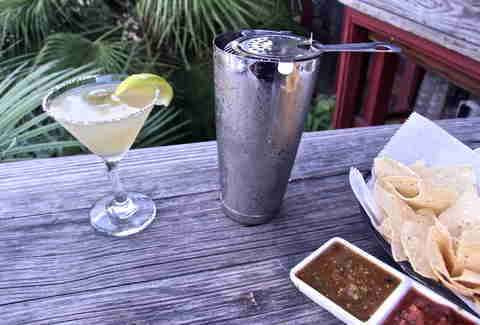 Because one cannot live off margaritas alone, some crafty local invented the Mexican martini (quite possibly at Trudy’s, where many say the cocktail originated). The formula is quite simple: all the makings of a margarita are shaken and served up in a martini glass and garnished with olives (and perhaps a side bowl of olives, if you like it really dirty). Drink, repeat. Drink, repeat. But that’s all you get -- Trudy’s cuts you off after three! Walking inside Nau’s is truly a step back to a simpler time -- when the most pressing matter of the moment was whether to spend your change on a Charleston Chew or a roll of Necco Wafers. Find all that old-school candy and more at Nau’s, which doesn’t seem to have changed much at all since 1951. Slide into a swiveling chair at the diner counter, or slip into a little booth, and order from their menu of standards like burgers, BLTs, and fried egg sandwiches. But, above all, save room for a malt, a float, or a chocolate soda. 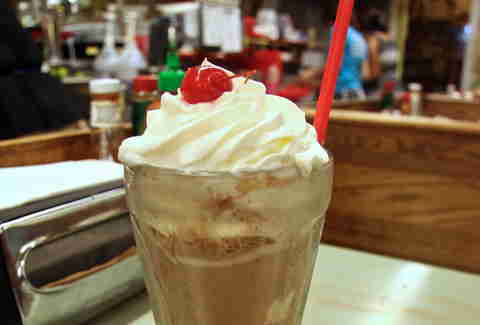 Much like an egg cream, the chocolate soda is made from milk mixed with chocolate syrup, then carbonated and topped with a scoop of vanilla ice cream, a squirt of whipped cream, and a cherry. 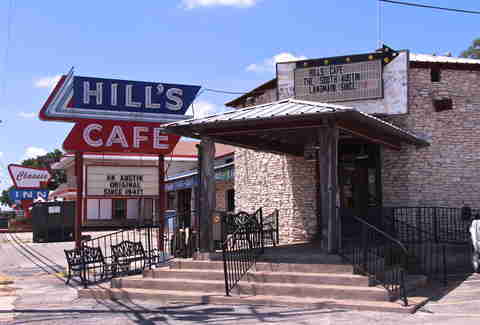 If you haven’t taken your visiting relatives to Hill’s Cafe yet, where have you been going, exactly? It doesn’t get much more Texan than this place, which has been housed in the former Travis County courthouse since 1947 and features a big outdoor patio and stage where local musicians are featured each weekend. The dining rooms pay homage to the likes of Darrell K. Royal, while booths within them are devoted to everyone from Willie Nelson to Rick Perry. But no matter what your political leanings may be, I think we can all agree that one of their massive chicken fried steaks is the thing to get here, topped with either thick white gravy or the "yella" gravy -- made from chicken stock. 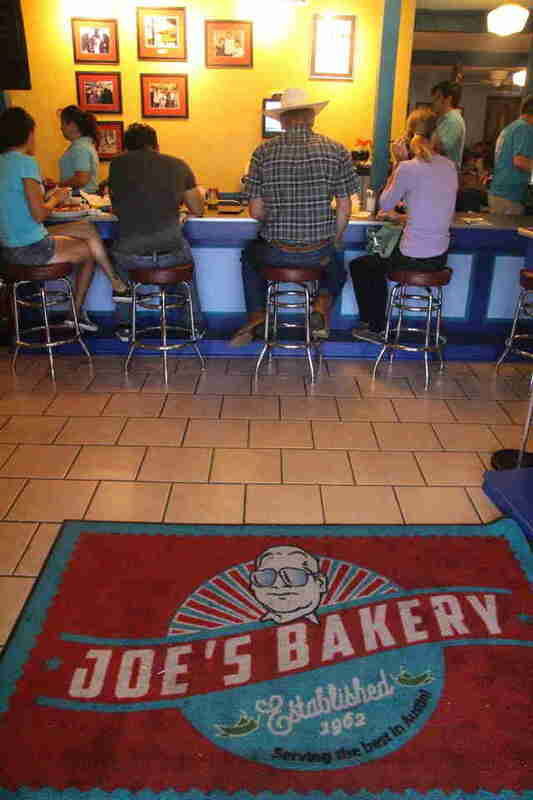 Somehow, no matter how packed Joe’s Bakery is on a late Sunday morning, the wait is never more than five minutes. It’s just one of those mysteries, like how their bacon is so good (fried) or why the migas are so delicious (cheese). While Joe’s Bakery does sell a variety of Mexican breads and pastries at the entrance, they do most of their business as a Tex-Mex diner selling breakfast and lunch, and they’re especially known for their carne guisada. Thick and saucy, with big chunks of pork, it tastes especially delicious when it arrives on the Joey Rocha Plate, named after a former employee with great taste. It comes with eggs made any style, sausage or bacon, potatoes, beans, carne guisada, and tortillas. Yes -- this "pie", in which the "crust" is made from loose Fritos and the "filling" is chili, cheese, and sour cream, is often served by Texas parents to their children as "sustenance". 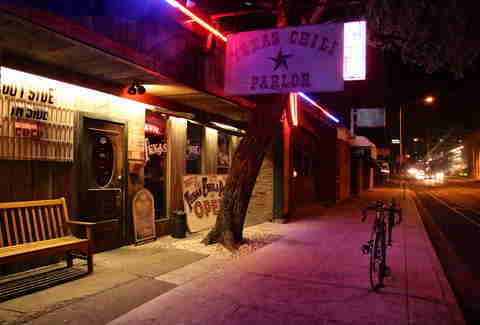 Do yourself a favor and try the version at neon- and Lone Star memorabilia-bedazzled Texas Chili Parlor, where you can opt for their classic chili or variations like habanero beef and pinto beans, white pork chili, venison with black beans, or a five-bean veggie version.